When we released DVR Examiner 2.0 this past July, we made a number of significant improvements to the program and user interface. However, we recognize these changes did not come without their challenges. I want to take a minute to break down the decisions we made and share what we are doing to address some of the challenges and concerns you have encountered. With the introduction of DVR Examiner 2.0, we released a completely redesigned user interface. However, we did more than simply change the buttons you click to recover your video evidence. Many of the changes we made as a part of the new interface were designed to allow us to incrementally improve DVR Examiner by quickly adding support for filesystems and new features. The new design also provides a more non-linear workflow for users who wanted to take advantage of it. Let’s talk about workflow. For those of you that used DVR Examiner 1.x, think back to how you used the software. You detected a hard drive, then scanned that drive. Once the scan was complete, you were presented with a list of clips found on the drive. Maybe you previewed a few clips (one at a time) and selected clips to export. Once you started the export process, you couldn’t utilize DVR Examiner until that export was complete. You couldn’t preview a clip or queue up another export with additional clips you wanted to access. DVR Examiner 1.x was a very simple, yet inflexible, workflow. What does that same workflow look like in 2.0? You still start by detecting and scanning a drive, but once the scan starts you have significantly more flexibility when using the software. For one, you start seeing clips in the clip list as soon as they are available. If you want to preview a clip before the scan even completes, go ahead! Export several clips? No problem. You can preview multiple clips, queue up multiple exports, preview while exporting, and more. In DVR Examiner 2.0, we strive to make the system fit your workflow, as opposed to requiring you to modify your workflow to fit DVR Examiner. In some situations, this level of flexibility has introduced some unexpected complexities that we are actively working to address. Another big change was increasing the clip sizes that DVR Examiner can access. In 1.x, we were limited to clips that were under 2 GB in size. As many of you know, DVR hard drives are getting bigger, the quality of video is getting better, and as a result, the size of clips have been steadily increasing. With DVR Examiner 2.0, we were committed to supporting clips of unlimited sizes. Unfortunately, providing the ability for the clip to scale to unlimited size introduces additional complexity for smaller clips as well. As a result, some users have reported slower performance from DVR Examiner 2.0 in comparison to 1.x. This is an issue we are looking to solve within future updates to DVR Examiner. Currently, we are attempting to optimize specific filesystems when we hear reports of performance issues, so please continue to provide us feedback! Since mid-August, we have added two additional engineers and two support technicians to our team. This gives us added capacity for getting these issues resolved, more in-depth testing going forward, and faster DVR and feature implementations. 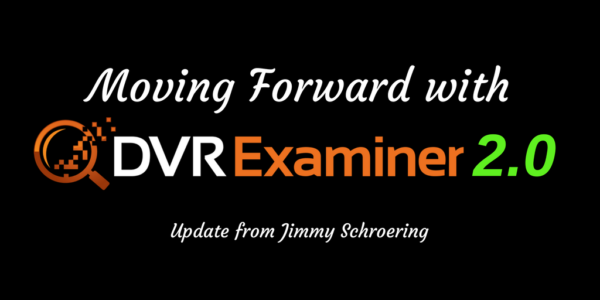 We will be releasing DVR Examiner 2.1 in mid-November, which will address many of the user issues reported. We also have several changes to the reading and parsing of data that should improve performance in general, and we will continue to address specific filesystem performance issues as quickly as we can. In addition, we have even bigger changes coming to DVR Examiner 2.2 in early January… the ability to simply update the DVR filesystems support so we can release new filesystems and updates to new filesystems as they are ready (often every two weeks). I know I speak for everyone at DME Forensics when I say that we appreciate your patience and understanding. Many of you have been extremely helpful in providing feedback, additional test data, and more to help us address issues. I personally cannot thank you enough for your support.